If you are building a screened in porch on an existing porch, use our helpful tips to become better informed. This is a project that can be done by the average do-it-yourselfer and requires basic carpentry tools in most cases. What if you are not very handy? No worries. And because it requires minimal carpentry work, hopefully it will be very affordable. Click here to find a local contractor to assist or do the job for you. If you see a screened porch in your future, we have ideas for you to explore. Whether you can build it yourself or you hire an experienced company like The Porch Company in Nashville, you will find a helpful overview of the process here. 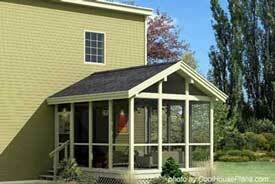 The information on this page is solely intended to give you the basic steps required to build a screen porch on an existing porch or deck. Every porch is different in some way so it is impossible to address every issue here. After reading through our steps, you should be able to decide if you can do it yourself or if you should hire a qualified, experienced contractor instead. This material is not a "how-to" guide. Use it for information only. To build a screened porch from an existing porch, you must start with a plan. Here are some porch plans popular with our readers. Your plan for building a screened in porch need not be too detailed at this point but should contain at least a basic scale drawing and measurements (very important). If you don't have a plan, Mary and I recommend you check out our Screen Porch Plans Section; you will be surprised at the many options you have (like the one at right). You can use these as is or modify them to fit your needs. Note the width between existing columns. This distance will either be spanned by a screen frame or divided to accommodate two or more screen frames. The picture at right, courtesy of Telian Construction Company, shows the space between the columns divided to accommodate two screen frames above a knee wall. 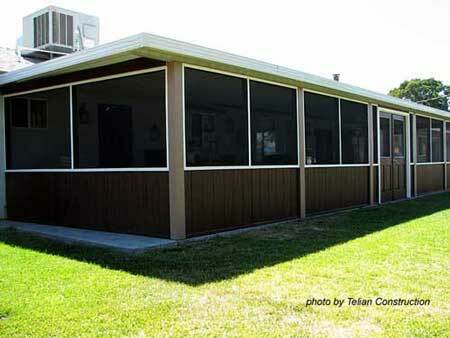 When building a screened in porch you have options. For example, you could have as easily divided this same space from ceiling to floor and not used a knee wall or you could have installed a railing instead. IMPORTANT TIP: If you plan to make it a 3-season porch in the future, you will need to ensure your framing is more substantial in order to replace screen panels with glass panel inserts. Consult your local codes department if you are building a screened in porch to see if you need to pull any permits. Chances are you won’t need any to build a screened porch unless you are adding additional electrical or structural features. Also check with your homeowner's association and read your subdivision's covenants if that applies to you. Be a good neighbor and potentially save yourself a lot of grief! If you are hesitant about consulting with your codes department please read our page on what you need to know about building permits before proceeding. When building a screened in porch or other structures, building permits not only protect you but can also save you money. If you have a balustrade (railings) or knee wall (a solid bottom portion) on your porch decide if you are going to keep it. Exterior siding is placed over the framing to create a knee wall on the screened in porch at right. The picture at top of page shows screened porch with a railing instead. For safety reasons and to comply with building codes, your porch most likely will require some type of safety railing. IMPORTANT TIP : Take precautions when building a screened in porch especially if your porch is elevated. A screen will not stop a child (or pets) from running through it. It's possible to retain the railings and build to the outside of them; however, in some cases you might have to remove the railings, build your screening, and then reinstall the railings. 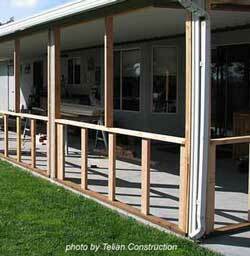 Otherwise, you can attach screen frames directly to your porch columns and floor. Determine your screening material. 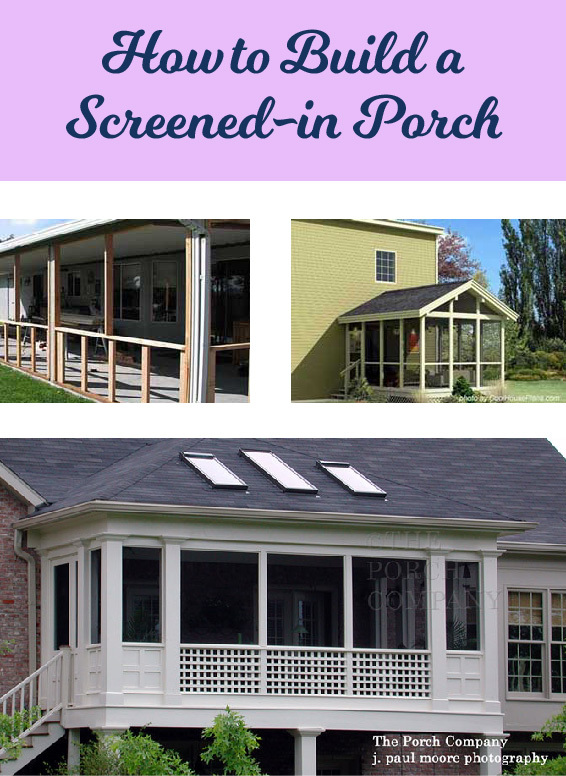 Use our handy screening materials guide to acquaint you with several options for selecting the right screening for your porch. There's screening available to meet every need, from preventing no-see-um bites to handling rowdy pets! Next determine the width of the materials and compare that to your column widths in Step 1 above. You will need to build the frames accordingly to fit your design. IMPORTANT TIP : It's usually more convenient and cost effective to use standard sizes when building a screened in porch rather than custom fitting your frames. However, see our favorite option below. My favorite option: Purchase screen framing kits. This avoids having to build your own frames which may not last as long and also require some skill to make. A wide range of screen frame colors are available and vary by size frame. They are designed for easy installation so that almost anyone can use them. Heavier gauge screen frames are available for applications such as solar screens and very large screens when no cross bar is desired to interfere with the view. Use heavier gauge frames when you are spanning long distances. To determine the screen frame size you must know the distances between your existing columns or any additional columns you have to add. Are your screens going from floor to ceiling or only halfway with another screen frame on top? Screen materials can come in lengths of up to 9 feet! If using homemade frames or just the columns themselves as the framing members, trying to stretch screen material wider than 4 feet takes skill to do it right. I recommend not exceeding a 4 foot width. You'll be much happier with the result and 48" provides a sufficient viewing area. Make sure your plan has these dimensions marked accurately. This is not the case with screen frame kits. You can screen very large expanses without too many problems which will give you a larger unobstructed view; another advantage of the kits. Consult our handy reference guide for making your own screen panels or options for screen frame kits. IMPORTANT TIP: I've built and used wooden screen frames and don't recommend them over screen frame kits available today. Wood, over time, will warp, twist, and need consistent maintenance to look good. I'd rather sit in my screen porch than paint my screen panels! You have your plan and you've selected your screening material, and determined whether you are purchasing screen frames, making them yourself, or just stretching the screening material from column to column. Based on that information, you've updated your plan to reflect the right measurements. In the porch at right, treated 2x4s (required for exterior use) were used to frame between the columns. Note that you will need a sole plate (affixed to the floor and the ceiling). Additional 2x4s were added to each side of the columns and framing was installed to create the knee wall along with dividing the space between the columns above the knee wall. You may be able to use the columns themselves without attaching additional 2x4s. 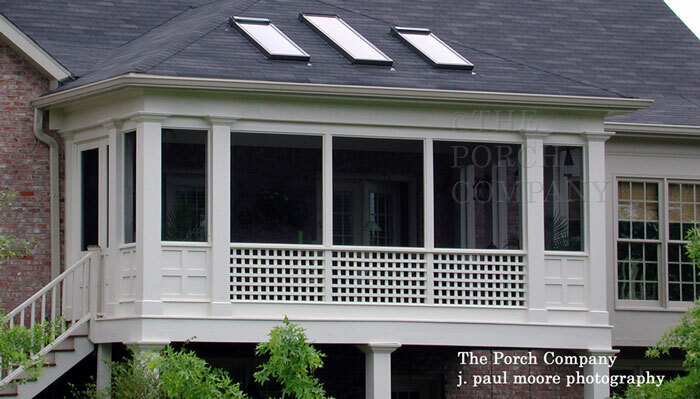 When building a screened in porch, you might discover porch columns that may not be flat. Many porch columns are round, tapered, or have a different design. The same goes for attaching the screening to your home's siding. How do you attach framing under these circumstances? You can purchase column wraps to convert various column designs into square or rectangular columns (available at most home improvement stores). Another option is to "box" out the column using 2x6s to create flat surfaces. Or, if you are a somewhat skilled carpenter, you can scribe the pattern of your existing column onto a 2x4 or 2x6 and cut it out using a band saw. Place the 2x4 against your column and use a compass to trace the pattern. Use a jigsaw to cut the 2x4 along the pattern line. This also applies if you have siding on your home. Use the same process. This ensures that the 2x4s lie flat against the surface when you are building a screened in porch and it is also visually appealing. Miter the studs to match the sole and top plates (you can join them at right angles without mitering). I've seen where a lot of guides for building a screened in porch leave this step out. However, my experience has been that applying paint or stain at this stage in the process is much easier than waiting till the screening is in place. I know, it's not fun; however, you'll be glad that you did later! IMPORTANT TIP: Now would be a great time to treat or paint the 2x4s. We always recommend using the best paint, stain, or sealer available on the market and acceptable to your budget. I know things cost a lot but you do save money and time in the long run if you use quality products. Using exterior deck screws attach the frames you made or those your purchased (according to manufacturers instructions) to the columns and framing on your porch. In the picture at right, the screen track has spline grooves just like a metal screen frame. The track is screwed to the porch columns and the screen is stretched across the frame. The spline holds the screening material in place. This is an example of just one type of screening kit. If installing your own wood frames you may need to attach 2x2s to the insides of the frame members. You'll then attach your frames to the 2x2s. IMPORTANT TIP: If you want to save money and recycle materials when building a screened in porch, consider using old screen doors. Search out a salvage yard and see if you can find screen doors in good repair. Refinish them and build your frames to fit your doors for instant screening! Did you ever think that you'd be building a screened in porch? You're almost done. It's trim time. 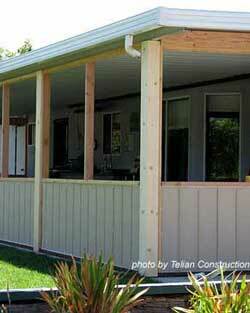 Consider using trim on your screened porch. 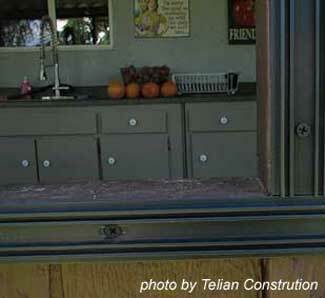 Installing running trim and brackets can make your screen porch "cool"! Building a screened in porch is a great DIY project. Congratulations on your new porch and enjoy a bug-free season. Our special thanks to Aaron at Telian Construction Company, Oakhurst, California, for allowing us to use their photos. If in the Oakhurst, CA., area please contact them for a free design consultation and put them to work for you!